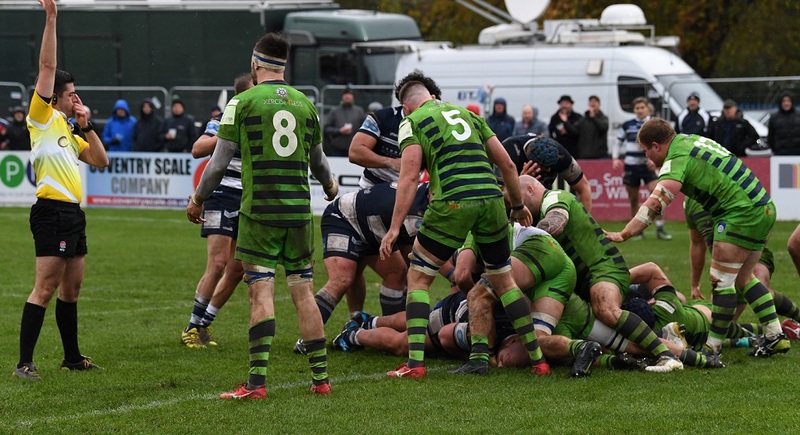 A try in each half – claimed by the prolific Max Trimble before the break then Charlie Beech in the final quarter – plus ten points from the boot of Will Maisey, saw Coventry Rugby to a battling 20-15 win over Yorkshire Carnegie. However, the bottom-of-the-table visitors, who responded through Pete Lucock and Andy Forsyth pushed the home side very hard in cold, greasy conditions, before a fourth home win in five Greene King IPA Championship starts was secured. The first scoring chance fell to Carnegie following a slashing midfield break from Andy Forsyth. However, as the ball was recycled and spun right, the retreating Phil Nilsen interfered from an offside position and was duly dispatched to the sinbin. But despite being short-handed it was the hosts who took the lead through a routine Maisey penalty after Carnegie infringed on the ground on their own 22. The away side worked George Watkins free on the right, and won a five-metre attacking scrum from his chip ahead, then following a sequence of reset scrums eventually sent centre Lucock crashing through a couple of tackles to the home posts for a try which Chris Elder converted. This sparked Cov into life, and they hit back immediately through Trimble’s fourth touchdown in three games. The pacy winger outsprinted the cover to Andy Bulumakau’s perfectly-weighted chip ahead to claim a score which Maisey improved. Heath Stevens then broke the visitors’ defensive line on halfway and burst into their 22. However, Cov’s handling failed to locate first Trimble on the left, then Junior Bulumakau on the right before a forward pass ended the attack. Shortly before half-time, Cov poached possession on the ground in their own 22 and some good support took them 60 metres upfield close to the visitors’ line. However, Carnegie’s scramble defence repelled the original threat after which a forward pass ended the attack. A simple Maisey penalty left the home side with a six-point interval advantage, which they threatened to increase when the Bulumakau brothers combined to take play deep into the Carnegie 22, only for the visitors to win a turnover in the tackle. Elder kicked a 35-metre penalty for Carnegie after Cov were caught offside, and after Rowland Winter had introduced a handful of replacements, Maisey was narrowly wide from 40 metres. The hosts then won three quick penalties, which gave them the attacking platform on the Carnegie five-metre line from which they eventually secured the match-clinching score. Latu Makaafi was held in goal from the first lineout, however from the resulting scrum a series of forward surges eventually took former Carnegie prop Beech over for his first try in blue-and-white, which Maisey improved. With 13 minutes remaining, a ten-point cushion seemed comfortable, but the visitors set up a grandstand finish when the impressive Forsyth broke a number of tackles to go 40-metres before forcing his way over in the corner. For a fourth time this season, this sentenced Cov to a nervy finale which required possession to be retained through a number of phases in the home 22 to secure four very welcome points. Tony Fenner; Junior Bulumakau (Scott Tolmie, 9-19), Andy Bulumakau (Stevens, 77), Heath Stevens (Sam Tuitupou, 57), Max Trimble; Will Maisey, Tom Kessell; James Gibbons (Biyi Alo, 57), Phil Nilsen (Scott Tolmie, 46), Luc Jeannot (Charlie Beech, 43); Dan Faleafa (Cameron Gray, 19-31), George Oram; Adam Peters, Jack Ram (Latu Makaafi, 50), Ben Nutley (Jack Ram, 55-57) (Pete White, 74). Chris Elder; George Watkins (Tom Bullough, 19), Andy Forsyth, Peter Lucock, Louis Brown; Jade Te Rure, JB Bruzulier (Olly Fox, 77); Marc Thomas (Andy Foster, 41), Joe Buckle, Craig Mitchell; Mike Myerscough, Matt Smith; Antonio Kiri Kiri, Josh Bainbridge, Dan Temm. 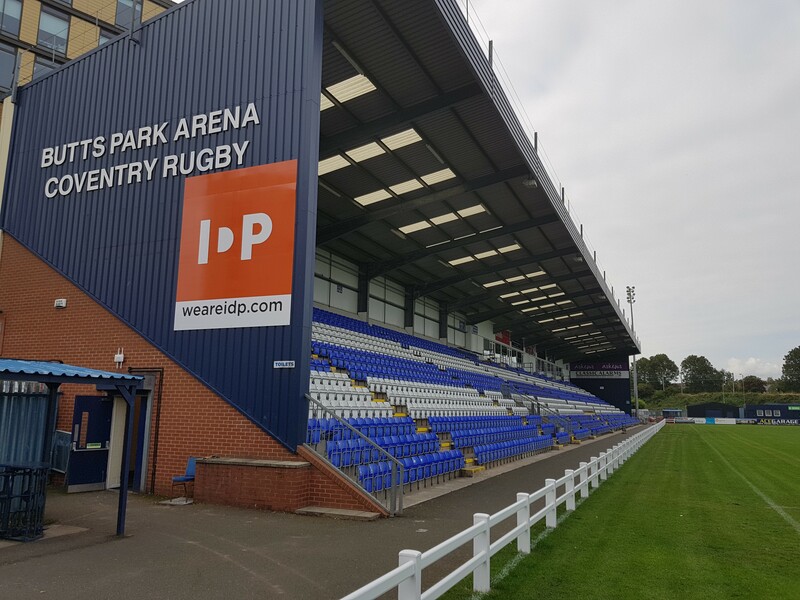 Posted in Match Reports, News and tagged Butts Park Arena, Coventry Rugby, Yorkshire Carnegie.